Color vs. Texture: Which is Your Favorite Type of Contrast? 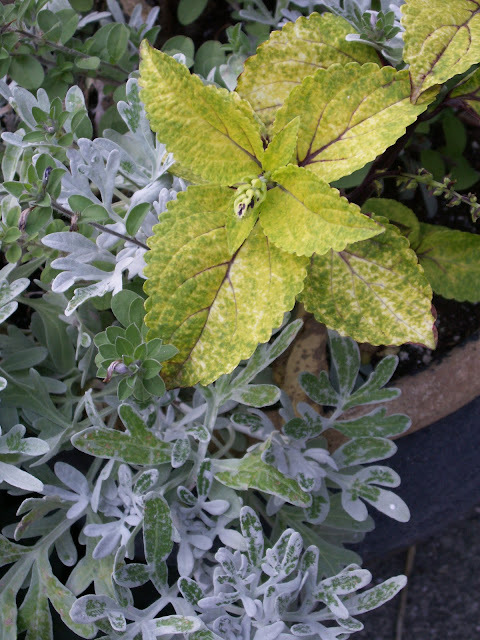 I posted a LOT of silvery shots yesterday for the August Foliage Follow-Up, so I thought that it might also be interesting to show the only two non-silver photos that ended up on my hard drive after my foliage-focused garden tour. After uploading the photos, I realized that they illustrate two very different types of contrast that I play with in my garden: Color contrast, and texture contrast. 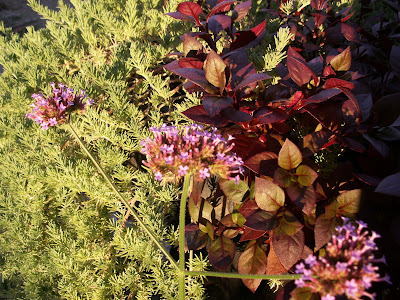 Green 'Chubby Fingers' sedum, dark 'Chocolate Chip' ajuga and golden creeping jenny mingle amiably on the edge of the driveway garden. 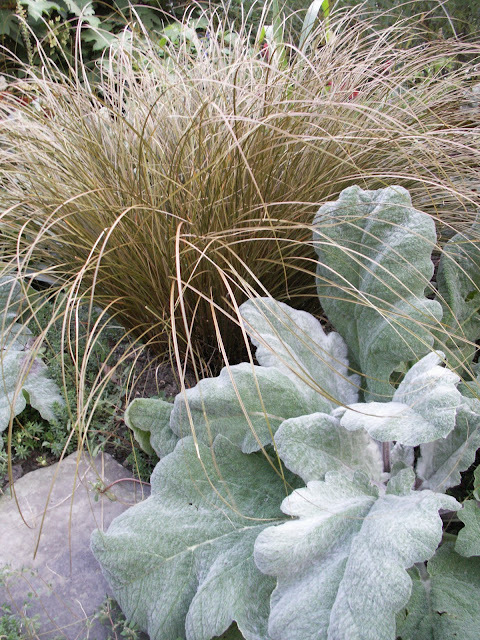 In a closeup photo like this, you can see some textural contrasts as well... but in the grand scheme, when you are viewing the garden from normal height, these small-scale groundcovers all provide a similar, fine texture for the garden floor. 'Hameln' pennisetum, sedum spurium* and oakleaf hydrangea. All three plants feature a medium shade of green, with reddish/brownish accents in their flowers, stems and leaves... but the oakleaf hydrangea leaves are bold, and the fine-textured sedum and grass differ in leaf shape for additional textural interest. So what kind of contrast do you all employ in your own gardens? Do you tend to steer clear of all contrast, or do you find that one type of contrast is more pleasing than another to your eye? I'd love to hear everyone's thoughts on this... particularly as a have a few garden areas to revamp in the coming year! 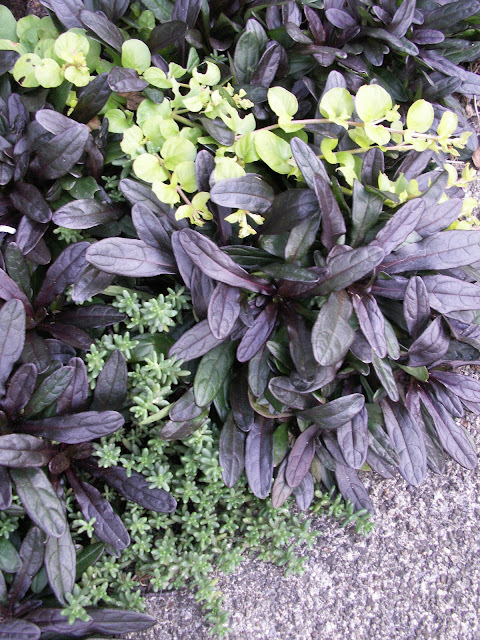 *Note: At various times, I have purchased 'Voodoo', 'Fuldaglut' and 'Dragon's Blood' sedum spurium, and each has been moved and transplanted so often that I have no idea which one(s) are in any particular area of the garden. They are much easier to tell apart in the springtime when their foliage colors are strongest--during the summer, as you can see above, they mostly fade to green. 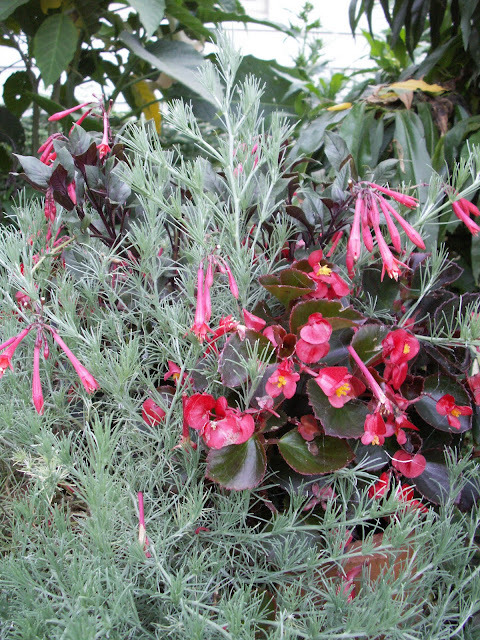 'Voodoo' tends toward a chocolate or grayish red color, 'Dragon's Blood' to deep red, and 'Fuldaglut' often has a glow of bright green on the centers of its red leaf tips in the spring. 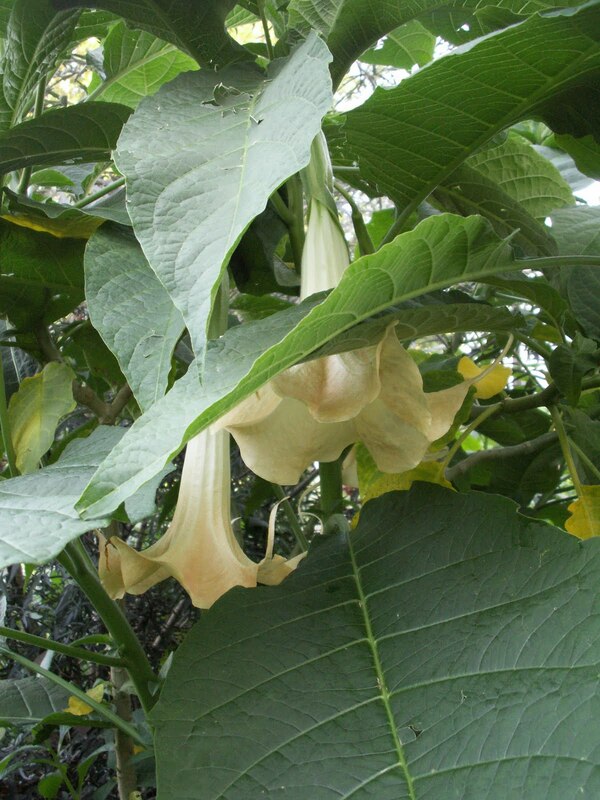 I would recommend any or all of them for planting, if you are so inclined. Each month, when the Foliage Follow-Up rolls around, I walk around in my garden and take pictures of anything and everything that catches my eye. Back inside, I scroll through the new photos to look for a common thread--and sometimes make a second trip out for even more photos that fit my chosen theme. One of two silver lotus vine I have planted. 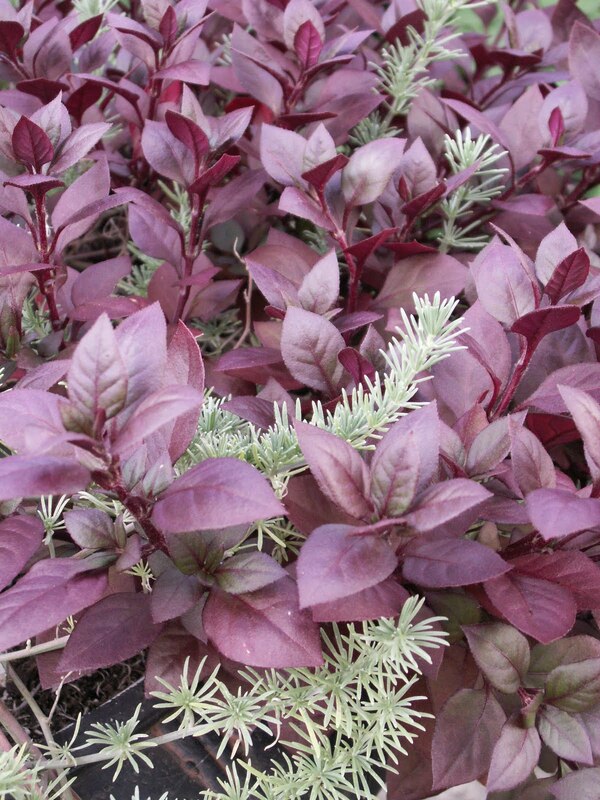 This one (also shown in the first photo) began life in a hanging basket and now lives in the urn along with purple alternanthera, 'Vista Burgundy' salvia, celosia and a red spike. 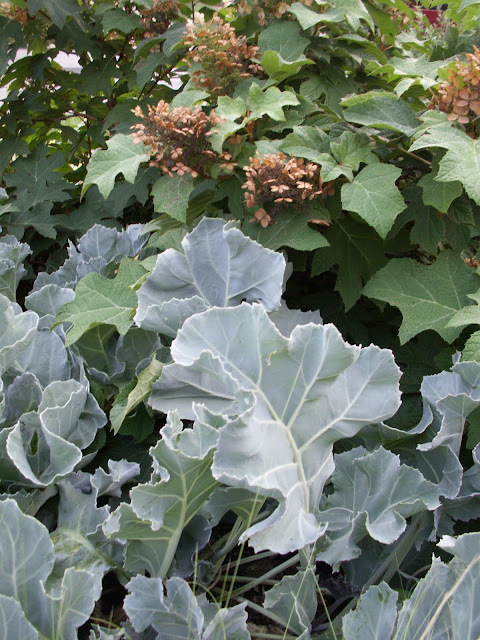 Powdery blue sea kale leaves hold their own against the bold foliage of the oakleaf hydrangea. 'Silver Falls' dichondra bridges the gap between 'Bandana Cherry' lantana and the red Japanese bloodgrass. 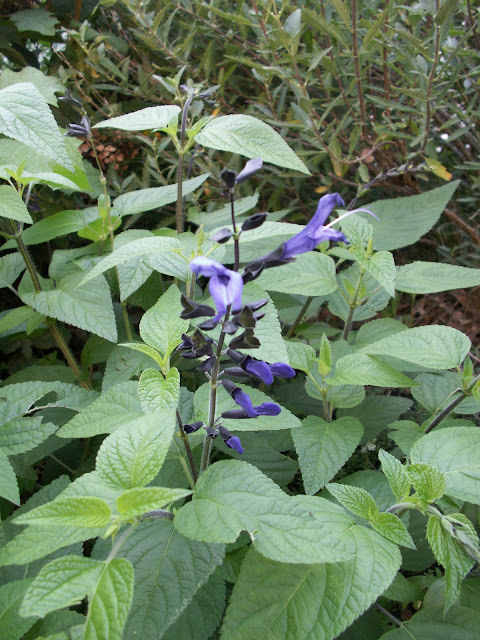 You knew this was coming: A photo of my latest obsession, salvia argentea (a.k.a. silver sage). I like dusty miller in general, but my inner plant snob only seems to remember the many ways it is usually abused in yards around here... and urges me to buy something (anything) else. 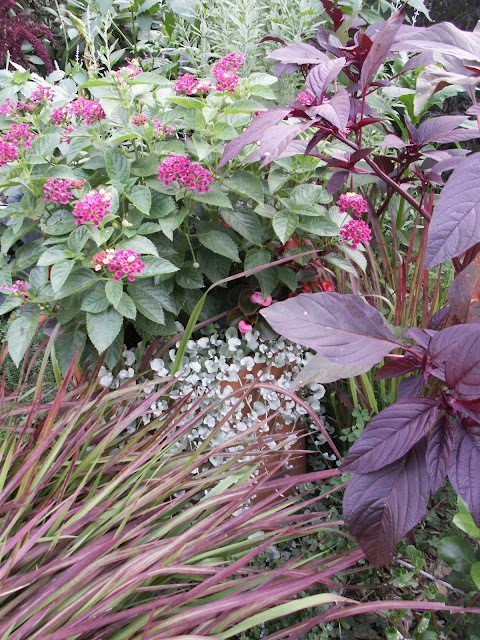 This year, we were able to compromise and plant 'Silver Cascade' (above) along with 'Blue Daze' evolvulus, a feathery magenta celosia, and a coleus that looks an awful lot like 'Wizard Pineapple' but came as part of an unnamed multipack. 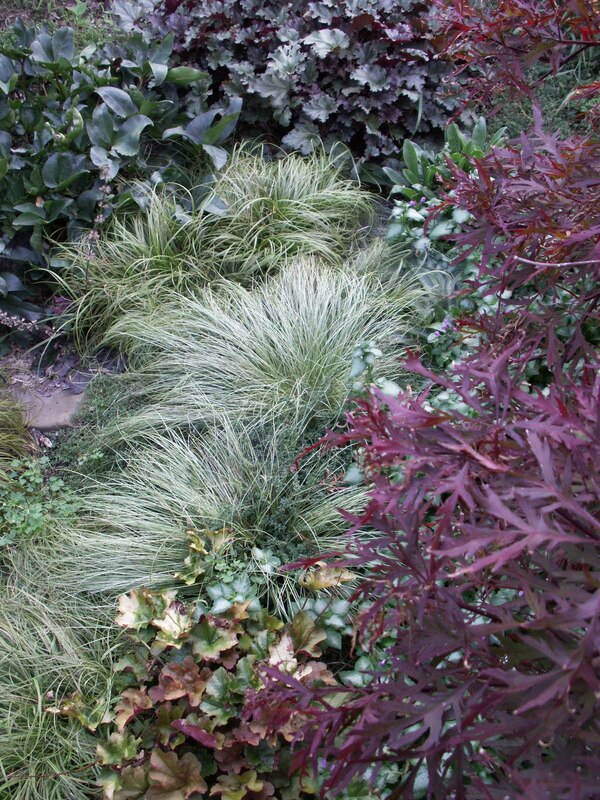 Two silvery plants in this photo, to end the silver streak: 'Purple Dragon' lamium sprawls out from beneath the Japanese maple, and short fountains of 'Frosty Curls' carex comans froth up between 'Beetlemania' carex, 'Ivory Prince' hellebores, and various heuchera. Hope you enjoyed the silver rush here in the August Foliage Follow-Up. 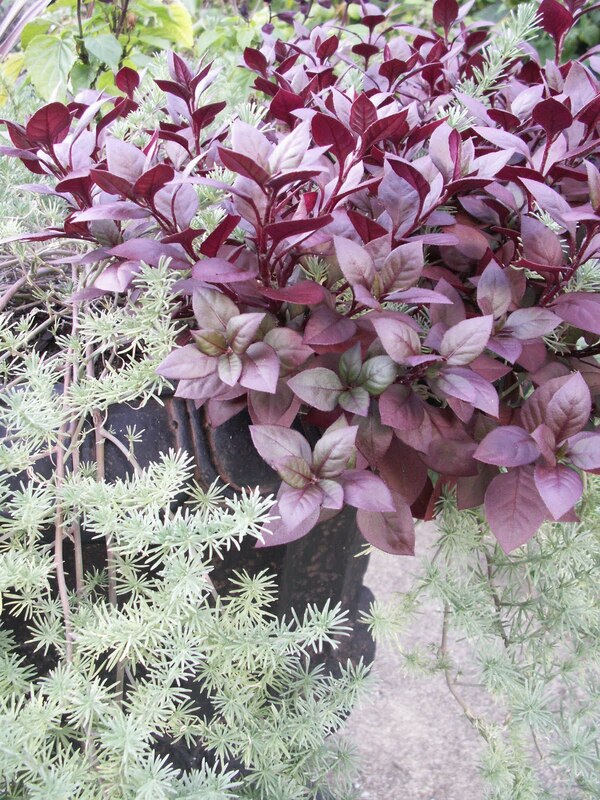 For more great foliage from around the world, check out Pam's August Foliage Follow-Up over at Digging! August is always an exciting, but bittersweet, time in the garden. 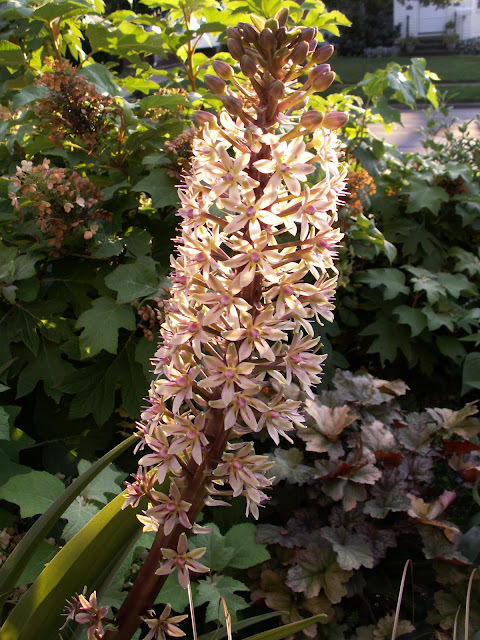 It's exciting to see the late summer bloomers, like the Japanese anemone and the pineapple lily featured above, return. And it's always fun to see where the tall verbena decide to reseed themselves. 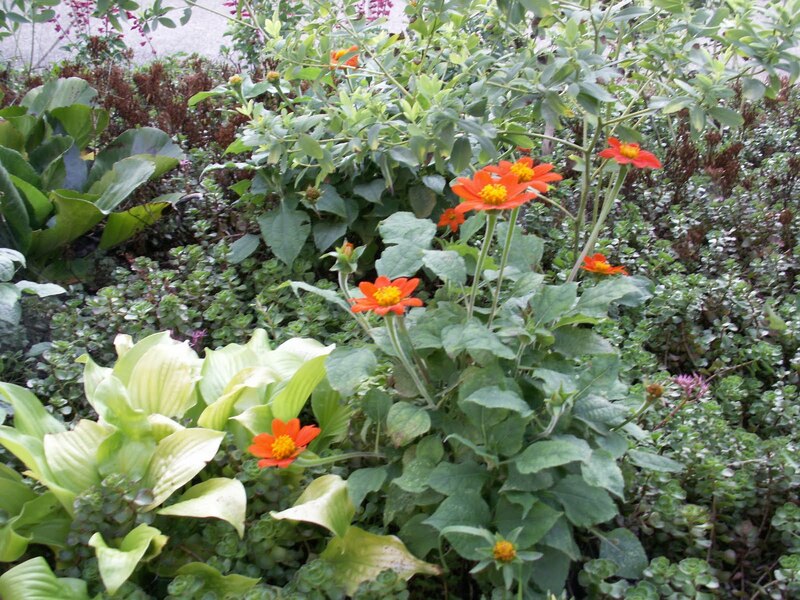 And it's always fun to see how well the drought-tolerant annuals have fared. 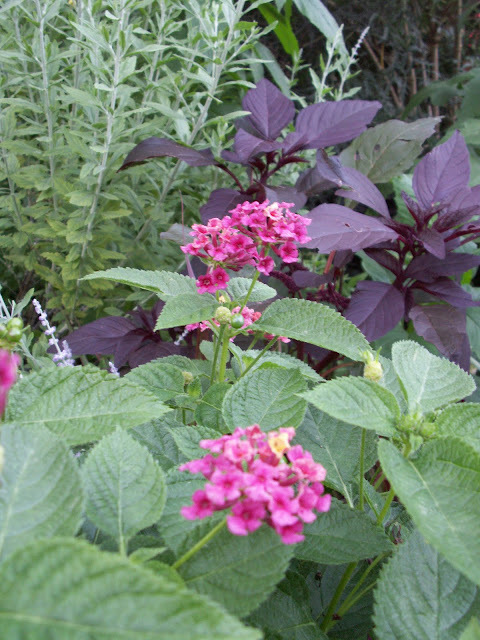 In the front yard, that means the usual snapdragons, portulaca, and 'Black and Blue' salvia, along with the new-to-my-garden "Mexican sunflower, a.k.a. tithonia. 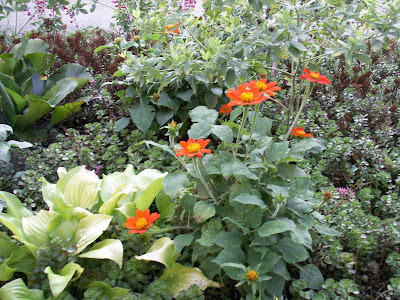 Unnamed orange-flowering tithonia, emerging from red sedum. 'Bandana Cherry' lantana--the flowers on this are so variable in color that I'll definitely choose a different variety next year. The surprisingly resilient 'Gartenmeister Bonstedt' fuchsia triphylla and 'Vodka' wax begonias, both currently overrun by lotus vine foliage. 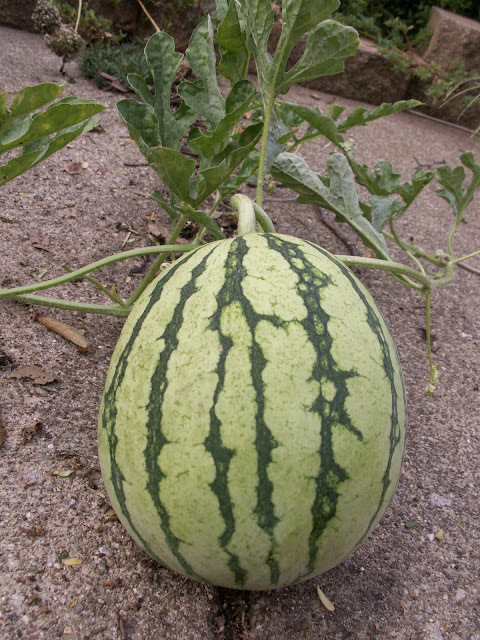 The bittersweet part of August comes with the knowledge that there are mere weeks left of the growing season. So many good intentions and best-laid plans have come to naught, so many missed opportunities have passed me by. 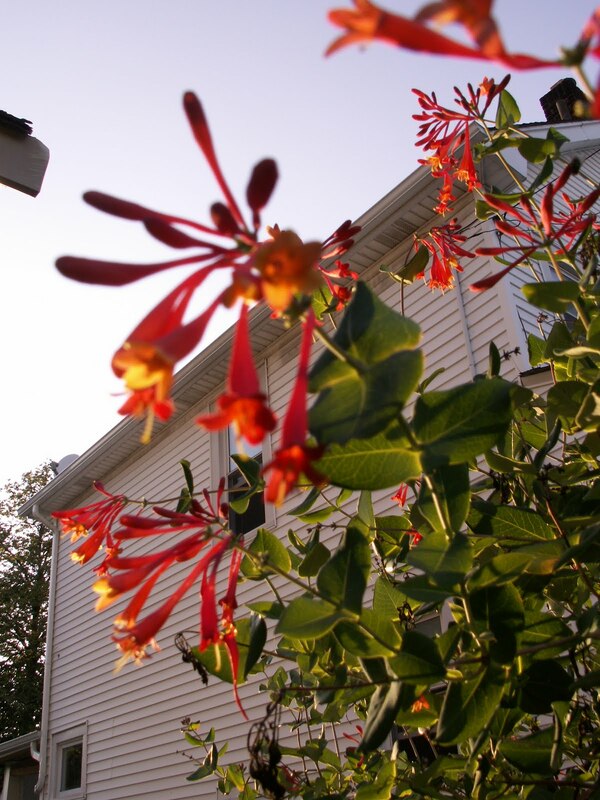 There's nothing to be done about it now, though, except enjoy the last big flush of the native honeysuckle agains the neighbor's house and the blue sky... while I still can. For years now, Carol at May Dreams Gardens has been hosting Garden Bloggers' Bloom Day on the 15th of every month. To see what's blooming around the world right now, visit her August Garden Bloggers' Bloom Day post here. Or scroll down to see the rest of my own August bloom list. Happy GBBD! Other plants also in bloom today: True blue plumbago, hardy blue plumbago, bronze fennel, 'Hameln' pennisetum, oregano, almost all of the hostas, regular Japanese anemones, lots of 'Vista Burgundy' annual salvia, everbearing strawberries, 'Hopi Red Dye' amaranth, the orange-and-yellow gladioli that decided to resurrect themselves after several years' rest, Russian sage, broccoli (darn it), 'Purple Dragon' lamium, red pentas, red and other self-sown snapdragons, various caryopteris, achillea, and at least 4 different kinds of basils. 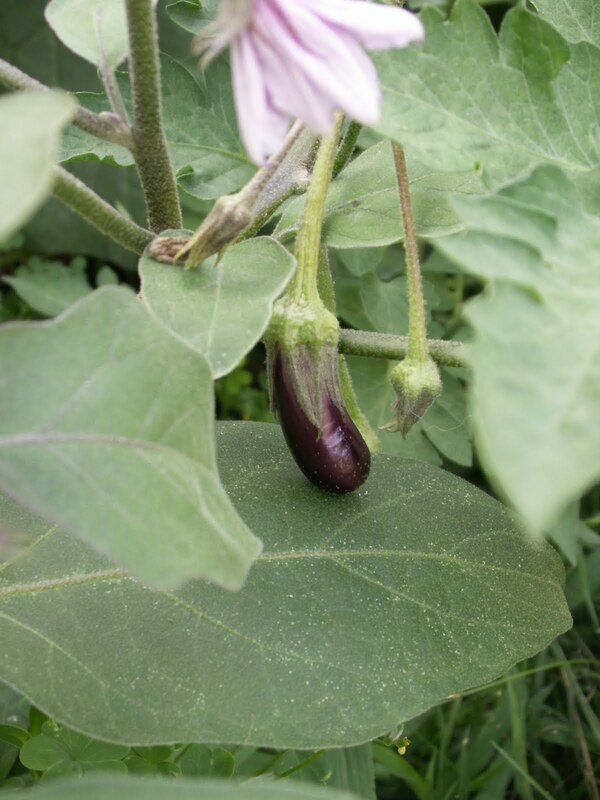 These are the delicious, never bitter, super easy to grow 'Ichiban' japanese eggplants, by the way. I fell in love with them maybe 5 years ago, and I don't foresee a time when I will want to trade them for another type. They're simply perfect. There's a lot going on in the front yard these days. Lots of color (even though there are few blooms) and lots of texture through the many, varied plants that reside there. It's finally starting to look like the drought-tolerant tapestry that I had envisioned! I know that I have mentioned this before, but one of my favorite things about the front yard is the way that the evening sun provides pretty backlighting that just makes all of the foliage colors glow. These purple heart leaves are normally so dark that they appear to be almost flat in color, but when they are backlit, they show an amazing amount of shade variation and detail. Even the silver sage, salvia argentea, is transformed by the setting sun. Its thick, downy leaves show off glowing light green patches and some pretty veining detail. 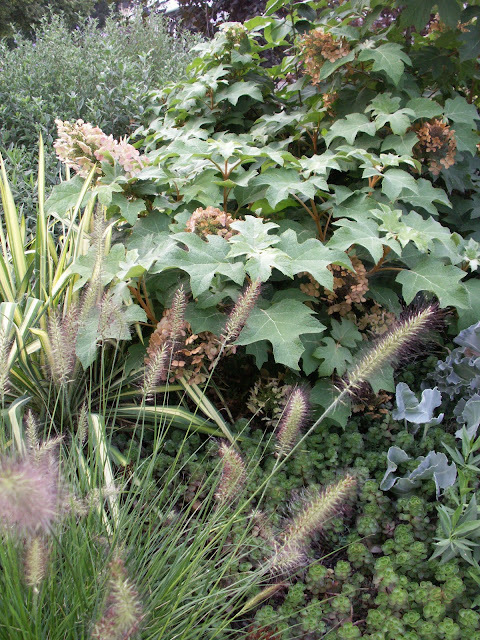 The salvia plants themselves offer up a nice textural counterpoint to the fine-foliaged sedums and brown grasses (mostly carex buchannii) in the front yard. Right next door, sunshine turns the leaves of my pineapple lily ('Sparkling Burgundy' eucomis) to shades of yellow-green. You can really see the color contrast when you compare the green leaves to the burgundy ones in the background that are shaded by the oakleaf hydrangea. And yes, once again I am looking forward to the pineapple lily's bloom! I love how the color of the stalk and buds are picked up by the rosy tint of the oakleaf hydrangea in the background. 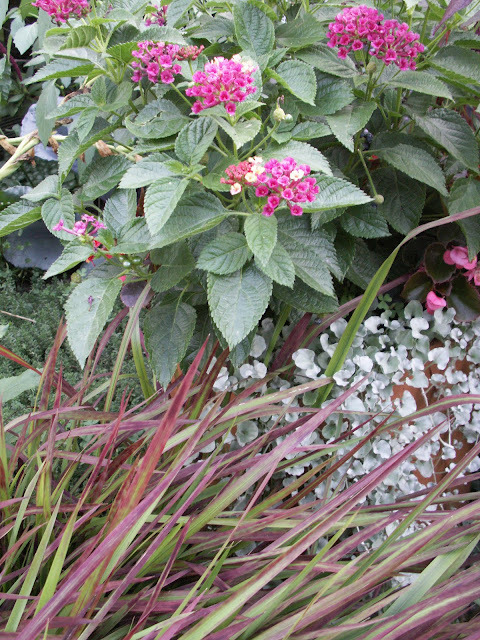 I try to tie in a few things like this throughout the entire front yard garden--it helps to keep the garden looking like a cohesive design, rather than a mishmash of randomly chosen plants. More of a tour of the new front yard garden to come... but probably later in the week. It seems that we have more thunderstorms in the near future here. I never mind thunderstorms, but I really wish that they would cool things off a little bit. 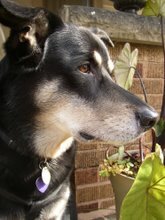 The tomatoes might be loving this weather, but my sled dog Garden Assistant definitely does NOT approve!